Chili Pepper – On-Demand Recirculation Pump For Faster Hot Water! 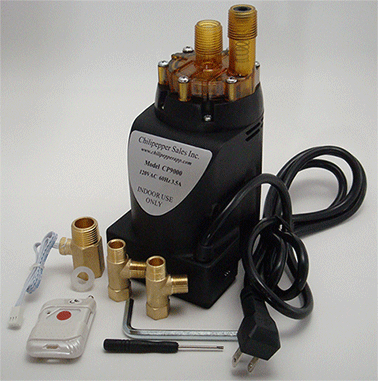 Chilipepper On-Demand Recirculation Pump For Faster Hot Water! Works with ANY Water Heater… Even Tankless Water Heaters! Saving Time, Water and Energy = Saving Money! Easy Installation – Connects with Hoses – No Plumbing or Soldering Needed! Powerful! One Small Pump Can Work for an Entire House! Eliminate Waste – Save Water! The Chlipepper recirculates the cool water from the hot water line back to the water heater to be reheated instead of running it down the drain. Eliminating that wasted water saves thousands of gallons of water every year. A typical family of 4 can save over 12,000 gallons of water per year! Not running that water down the drain reduces the amount of sewage that needs to be treated as well! water usage has dropped an average of 800 gallons. that’s 20%! Works with Any Type of Water Heater! The Chilipepper works with any kind of water heater at all, from a traditional tank-type water heater to solar and even oil-fired boiler type heaters. The Chilipepper even works with tankless water heaters! In fact, the Chilipepper greatly improves the convenience of tankless water heaters, which provide endless hot water but with and incredibly long wait! Water Heater manufacturers Bosch and Rinnai have both tested the Chilipepper system and approved it for use with their tankless water heaters. Designed for the Do-It-Yourselfer, the Chilipepper is easy to install even by the most novice homeowner. It is designed to sit or mount under a sink and connect to your water supply with flexible stainless steel hoses – so it doesn’t require any alterations to your existing plumbing. The Chilipepper comes with everything you need to install it, except for 2 lengths of stainless steel flexible hose which are readily available at any hardware store. Please take a look at the installation instructions to see just how simple the installation is. The installation instructions can be viewed from the menu above. Also, find out where the best location for your Chilipepper would be, and how many other fixtures it may affect with this Test Your Plumbing page. Many water companies offer rebates for customers who install hot water recirculation systems like the Chilipepper – some as much as $200! That would be like getting a Chilipepper for FREE! Check with your local water company to see if they have any rebate programs..